Creamy beige with deeper cream veining. 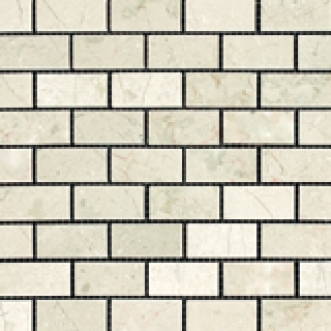 Crema Nova Polished Finish: in 12"x12" tiles; 1"x2", 2"x4" brick format mosaics, 3"x6" stacked mesh-mounted mosaic; Irregular 12" Linear Strip mosaic; 1"x12" Pencil Rail and 2.5"x12" Chair rail. As they are modular, these polished marbles can be used together to create attractive patterns.